In my previous post, recipe #324, (click here), the eggs and tomatoes are cooked together with bagoong na alamang (shrimp paste), a very Pinoy way to make a tomato dish. In this recipe here, I am using the basic sauteed tomato and then topped with Sunny Side Up Eggs, a recipe I learned to make from my daughter-in-law from Texas who is Spanish-Mexican. They call it Tomates con Huevos in Spanish. She loves to eat this with toasts. but it is the way I like it....no runny yolk for me. This is quick and simple way to serve eggs and tomatoes and there isn't really a measurement here, but for just one serving you can use 1 small tomato and make sure that it is ripe. Saute some chopped garlic, onion and tomatoes, in that order, in olive oil or canola oil. Season with salt and pepper. Spoon mixture on a plate then place Sunny Side Up Egg on top. Serve with plain toast bread or toasted garlic bread. For home made garlic bread, go to post #274, click here. For some reason I had a flashback about the tomato side dish that we used to have in Pangasinan. I just barely recalled how we eat the tomatoes mixed with alamang na bagoong with itlog na maalat (salted eggs) then with a particular seaweed we call in Pangasinan as "arurosep". I copied a picture from Flicker so you can see what I'm talking about. 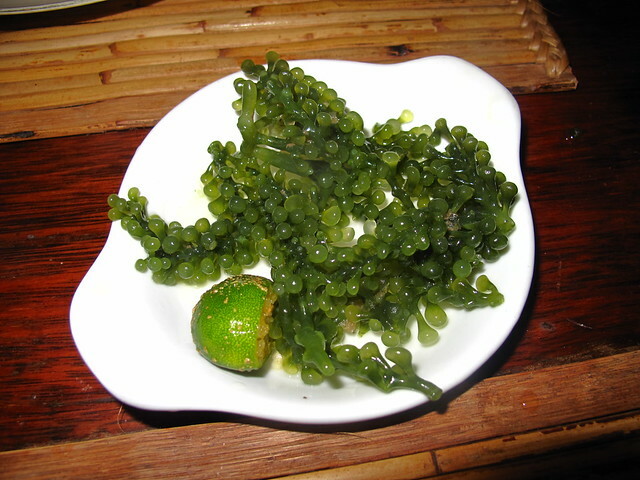 I don't know what it is called in Tagalog or in other dialects. Anybody have a name for it?